Welcome to yet another week of shock and awe, hopefully in a good way, but then you can never be absolutely certain of anything when Mars is angling Neptune and the Sun is up close and personal with Uranus. This is the first Sun-Uranus conjunction of this seven-year cycle in Taurus, and it provides our first opportunity to see what discoveries and breakthroughs Uranus can inspire to benefit mankind, and also what factors have to be removed in order for new pathways to emerge. Years ago, when I was pregnant with my first child and studying for the Faculty’s Diploma exam, I noticed the Sun was conjunct my natal Uranus. How perfectly, I thought, that chimed with the forthcoming astrological test. Later that day as I was shopping in my local supermarket, a weird fizzzz started to emerge from my basket. The explanation arrived all too suddenly when the can of carpet cleaner I had selected burst its cap sending spurts of foam into the aisles and along the shelves. And for some strange reason this prompted me in my heavily pregnant state to run like a banshee to the check out. The cosmic joker had struck again. On Monday evening, as I was driving back from London to my home in Wells with its beautiful cathedral, news reports began to come in of a fire in Notre Dame, Paris. By the time I walked through the front door, most of the roof of Notre Dame had gone and the spire toppled. There is something about a building that has stood for centuries, an icon among icons, shrouded in flames, that is viscerally shocking. It was impossible to look at the footage and impossible not to look at it. Later that night our cathedral bells rang out in sympathy with Notre Dame. It was Easter week. Fortunately, the devastation was not as complete as everyone had feared. The cathedral’s main structure has been largely saved, including the “twin towers”, and most of the irreplaceable art work and artefacts were removed, some before the restoration work began. The astrology of the event is suitably impressive. At 18:20 CET a fire was reported in the attic of the cathedral. After a check, no fire was to be found. Just before seven o’clock, fire was seen under the roof: it spread rapidly, bringing down the spire an hour later. At 18:20, zero degrees of Libra was rising and zero degrees Cancer was on the Mid-heaven. (That the cardinal points were involved reveals the magnitude of the event.) Zero degrees Aries-Libra is the MC-IC axis of France’s chart. The Ascendant was within a degree of France’s natal Venus. Uranus at two degrees of Taurus was closely opposed to France’s natal Neptune which is also conjunct Jupiter. 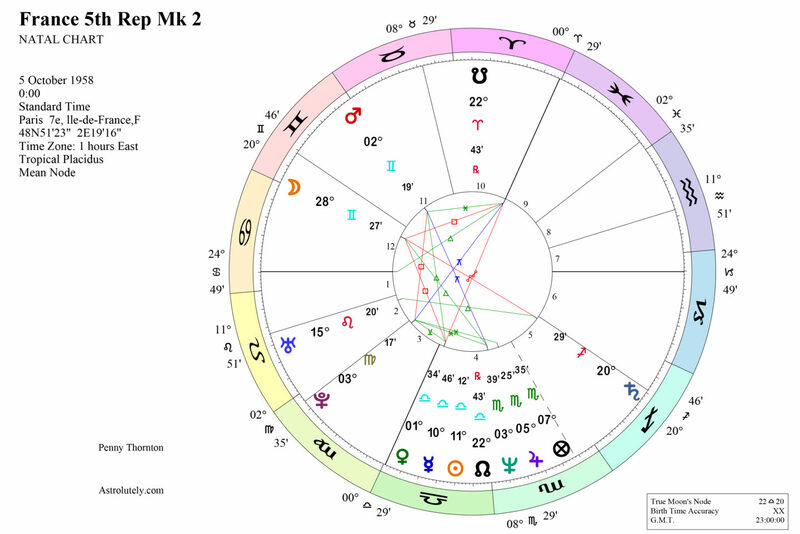 The Moon at three degrees of Virgo was precisely conjunct France’s natal Pluto. That the Moon was trine Uranus and sextiling natal Neptune-Jupiter may well have prevented the cathedral from being razed to the ground. Certainly, there is poetry in the Uranus opposition to Neptune and Jupiter, that most spiritual of combinations, and the Ascendant on France’s natal Venus, which is placed next to the IC, the very root and soul of a nation. You may also note that Pluto is currently within a degree of France’s Descendant, with Saturn close behind. And France is certainly having its troubles. Not only Brexit, naturellement, but the Gilets Jaunes movement which has caused havoc and a great deal of destruction to property over the past few months. Macron’s presidency is fragile. 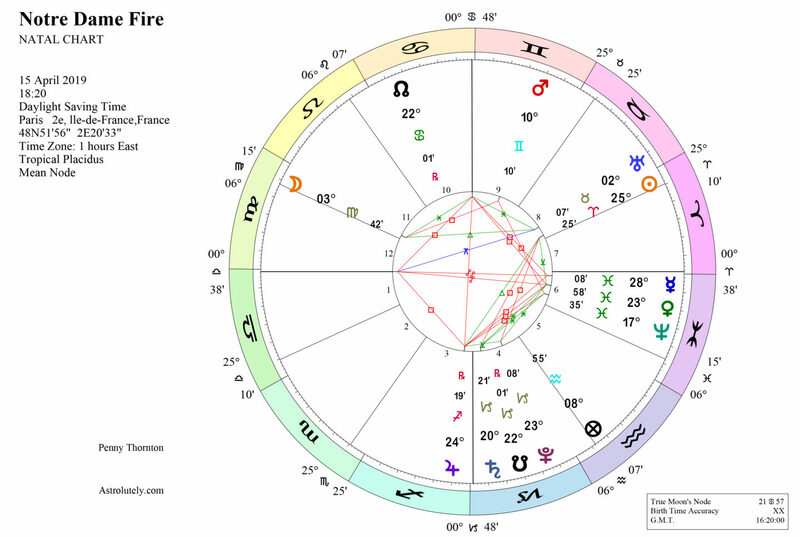 Pluto, of course, symbolizes transformation and its presence on the Descendant angle of France’s horoscope is a promise that out of destruction will come a new Notre Dame, a new France even. The night after the fire, President Macron declared the cathedral would be rebuilt with an international fundraising campaign. Hundreds of millions of euros have already been pledged. It will take years, if not decades. But Notre Dame will stand proud again. In a way, broken but not beaten, she already is. Get my monthly newsletter for an astrological view of world events. Feeling lost? Wondering why there is so much mist and confusion surrounding world events? Read The Neptune Papers. Listen to Penny’s weekly in-depth forecast. Reading the characteristics that our co-workers display and learning how to cooperate with them successfully lies at the heart of Astrology in the Workplace. Find out your colleagues’ signs of the Zodiac and you can turn their strengths and weaknesses to your benefit. Astrology in the Workplace will help anyone who wants to bring out the best in themselves and everyone else.